The chickens have escaped their coops and its your duty to help return them to their homes but you’re not the only one the farmer asked for assistance. Its a race against time to collect and coop the most chickens, with help from your trusty dog and some other tricky tactics. In this fun and lighthearted game for the whole family. Collect and coop same color chickens to earn points. Strategically time the placement of your chickens to maximize your coops value. Different chickens do different things when played. 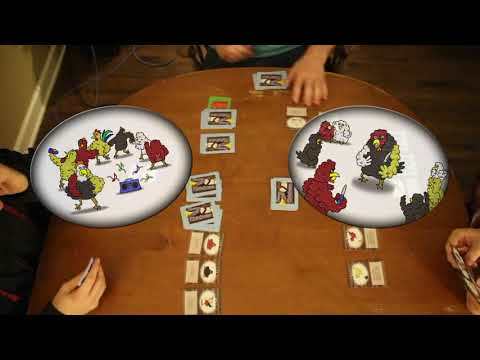 Some may steal other players chickens or even randomly redistribute all chickens in play. With many different kinds of chickens including; Raging Chickens, Wild Chickens, Fat Chickens, and Roosters. You'll be feeling like a real chicken farmer in no time. Easy to learn and fun for any age group, a great game for casual players and families.